The Greatest Movies of All Time? If you are a classic film fan by now you have the news about the latest Sight and Sound critics' poll concerning the greatest films of all time. Ever since 1962 the poll, held once every decade by the British Film Institute's official magazine, has resulted in Citizen Kane (1941) being voted the greatest film of all time. This year that did not happen. Instead, Alfred Hitchcock's Vertigo (1958) took the top spot, while Citizen Kane came in at number 2. To say that cineastes were taken aback would be a minor statement. Indeed, it seems that the moment the poll was published Twitter, Google+, blogs, and various other sites on the internet with filled with debates over the poll's results. Some people were taken aback that Citizen Kane, voted the greatest film of all time in the Sight and Sound poll five decades in a row and a film that generally tops every other film, should lose to, of all things, an Alfred Hitchcock film. Yet others are thankful that a film that they considered overrated has at last been dethroned by a more worthy adversary, particularly one directed by a cinematic master. Still yet others have had reactions somewhere between these extremes. As for myself, I must say that I generally find myself disagreeing with such polls. Indeed, as far as I am concerned the greatest film of all time is neither Citizen Kane nor Vertigo, but Seven Samurai (1954). 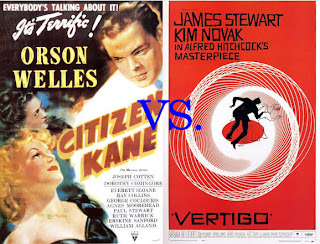 As to which is better, Citizen Kane or Vertigo, I would have to give that honour to Citizen Kane. Not only do I think Citizen Kane was the more revolutionary of the two films, but I also think it has a more fascinating story. In fact, while I do love Vertigo, it isn't even my favourite Alfred Hitchcock film of all time. That would be North by Northwest (1959), followed by Rear Window (1954) and The Lady Vanishes (1938). I am not sure Vertigo would rank in my top 50 greatest films of all time, although it might rank in my top 100. On the other hand, Citizen Kane is what I consider the third greatest film of all time, after Seven Samurai and Casablanca (1942). Beyond the fact that I believe The Seven Samurai should have topped the poll, I do have other issues with it. Namely, I do not think Tokyo Story is the third greatest film of all time. In fact, while I like the film well enough, I do not think it would even rank in my top 100, let alone my top 50. While my top 50 would have multiple Stanley Kubrick films, 2001: A Space Odyssey (1968) would not even make the cut. Instead, my top Kubrick film would be Dr. Strangelove or: How I Learned to Stop Worrying and Love the Bomb (1964), which I would place in the top ten greatest films of all time. While Some Like It Hot (1959) would make my list, I would also include Billy Wilder's The Apartment (1960), which would be my fourth greatest film of all time. Anyhow, I could go on, but I believe that one can see now that I do have issues with the poll, as I am sure many film buffs do. Indeed, in many respects the reaction of cineastes to this poll comes as no surprise to me. I do not think I have ever seen results of a poll on the greatest films of all time or a list someone has simply made with which film buffs ever totally agreed. The fact is that what makes film great is largely subjective. What one person considers the greatest film of all time, another might consider to be utter rubbish. Oh, there are those films that generally make lists of the greatest films of all time: Citizen Kane, Casablanca, Gone with the Wind (1939), and so on. There are also so those directors who are certain to have multiple films on lists of the greatest movies of all time: Alfred Hitchcock, Federico Fellini, Francois Truffaut, Billy Wilder, and so on. Even given these two facts, there will always be room for debate as to what is the greatest film of all time. Given that determining what is the greatest film of all time is something that is very subjective, such polls as those conducted by Sight and Sound might seem pointless. After all, even with several critics voting a certain film to be the greatest of all time, there will always be many who will disagree with that result. That having been said, I think such polls serve two purposes. The first is that they do get film buffs talking about the films themselves. This can actually be helpful in learning why others love a particular film and can even bring a new appreciation to a particular film that one had not yet realised. I rather suspect that there are many out there who will watch both Vertigo and Citizen Kane with a new set of eyes. Second, I think such polls can be useful in directing film buffs to classic films that they might not have seen yet. This might not be so important for experienced cineastes who may have seen the vast majority of the films on any given list, but it can be very important to those new to classic film. I rather suspect that most fledgeling classic film fans will seek out such films as Citizen Kane, Casablanca, and Gone with the Wind. Without such lists they might not seek out Seven Samurai, 8 1/2 (1963), or La Règle du jeu (Rules of the Game 1939). In this respect, then, such polls and lists can act as viewing guides for classic film buffs, letting them know films that they should seek out. In the end, then, it perhaps does not matter whether one takes issue with the results of any given poll or the choices on any given list. The fact that such polls and lists of the greatest films of all time spark conversation about film and can lead film buffs to watch many of the films that make such lists is enough to make them important. One might disagree that Vertigo is the greatest film of all time, but he and she will surely talk about it and they might seek out other films on the list. Writer Gore Vidal died Tuesday, 31 July 2012 at the age of 86. The cause was complications from pneumonia. Gore Vidal was born Eugene Louis Vidal, Jr 3 October 1925 in West Point, New York. His name would be changed long after his birth to Eugene Luther Vidal Jr. (his father's name was Eugene Luther Vidal) and "Gore (his mother's maiden name) would be added at his christening. When he was fourteen he simply shortened his name to "Gore Vidal." His maternal grandfather was Senator Thomas Gore of Oklahoma. Gore Vidal grew up in Washington, D.C. As his grandfather was blind, Gore Vidal often read to him and functioned as his guide. Gore Vidal attended Sidwell Friends School and St. Albans School. Mr. Vidal left St. Albans School to study in France, only to return after the outbreak of World War II. He then studied at he Los Alamos Ranch School in 1940 and later at Phillips Exeter Academy in Exeter, New Hampshire. During World War II he enlisted in the United States Navy where he served as a warrant officer and later a mess officer. He served in the South Pacific. It was following the war that Gore Vidal published his first novel, Williwaw, in 1946. His second novel, The City and the Pillar, published in 1948, would prove to be controversial for its portrayal of homosexuality. This would result in his next five novels being banned from being reviewed in The New York Times. As a result, Mr. Vidal took to writing mystery novels under the pseudonym Edgar Box. It was 1954 that Gore Vidal began writing for television. His first work was an episode of the long forgotten drama Janet Dean, Registered Nurse. Over the next several years he would write episodes of Suspense, Omnibus, Danger, Studio One, Goodyear Playhouse, Climax, and G.E. Theatre. By far his most acclaimed teleplay would be for Goodyear Playhouse. Aired in 1956, "Visit to a Small Planet," in which an alien visits the planet Earth. Meant as a satire of post war anti-Communist paranoia and proved enormously successful. He adapted it as a play in 1957. It was in the Fifties that Gore Vidal began writing screenplays, including ones for The Catered Affair (1956), I Accuse! (1958), and Suddenly, Last Summer (1959). As a novelist Gore Vidal was very prolific. Although he would only write three novels in the Sixties (Julian; Washington, D.C., and Myra Breckinridge), he would write several more over the next few decades, including Burr, 1876, Lincoln, Hollywood, and The Golden Age. His novels were often based on history. Lincoln dealt with the personal struggles of Abraham Lincoln and was based on letters, memoirs, diaries, contemporary news sources, and so on. The Golden Age covered the United States' entry into World War II, the war itself, and the post-war years. Mr. Vidal did not simply deal with contemporary history, but delved into ancient history as well, as shown by his novels Julian and Creation. His novels also often focused on gender and pop culture, the prime example of which may be Myra Breckinridge. In all he wrote around 30 novels. Gore Vidal also wrote plays. His first was Visit to a Small Planet, an adaptation of his own teleplay. He would go onto write such plays as The Best Man, Romulus, and An Evening with Richard Nixon. He would also occasionally write for television and film. He adapted his own play The Best Man (1964) and wrote the original screenplay for the controversial film Caligula. He had his name removed from the latter when it was changed dramatically from his original script. He also did some uncredited rewriting on The Sicilian (1987). For television he adapted his play On the March to the Sea for Theatre 625, and wrote the teleplay for the TV movie Billy the Kid. While Gore Vidal was famous for his novels, he may have received the most acclaim for his essays and memoirs. He wrote essays for various publications for nearly six decades. In the end his collections of essays would number nearly as many as that of his novels. 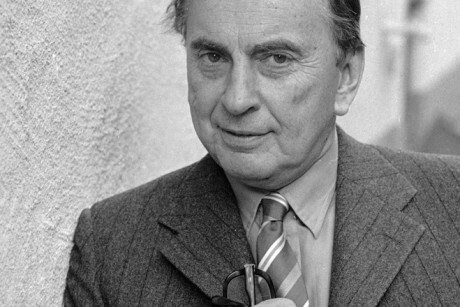 Gore Vidal could often be controversial in his essays and he could often rely more on aphorisms than logical arguments. Regardless, he was well known for his wit and the elegance of his writing. He published two memoirs, Palimpsest and Point to Point Navigation. Among the writers of the late 20th Century Gore Vidal is among those I admire the most. I did often disagree with him. Indeed, I thought some of his views were utter rubbish. That having been said, Gore Vidal was a writer that wrote with such eloquence and elegance that even one disagreed with him, one could not help but admire his work. His writing was often funny, often acerbic, almost always eloquent, and always learned. Whether one agreed with Mr. Vidal on any given point of view, one could not help but admire his writing. As acclaimed as Mr. Vidal was for his essays, I admired him more for his novels, particularly his historical novels. His fiction was every bit as elegant as his non-fiction. What is more, he had an attention to detail that allowed him to capture any given moment in time perfectly. After reading his various historical books, I felt that I knew Lincoln and Franklin Delano Roosevelt. Very few writers of the late 20th Century were capable of the eloquence and the ability to create realistic characters in the way that Gore Vidal was. He was also quite talented when it came to television and motion pictures. If "Visit to a Small Planet" is considered one of the great teleplays of all time, it is perhaps because it is so well written. While I disagreed with his idea often, I have to admit that he will probably be one of the few writers of the 20th Century to be remembered for years to come. Legendary singer Tony Martin died on 27 July 2012 at the age of 98. He was born Alvin Morris on 25 December 1913 in San Francisco, California. His family moved to Oakland, California not long after his birth. He was drawn to music while young and learned to play the saxophone as a teenager. While in high school he joined a local band of which future band leader Woody Herman was also a member. He attended Saint Mary's College of California in Moraga. He left when one of the instructors there informed him that he was flunking everything and should probably remain with music. He left college for Hollywood in an effort to get into films. It was then that he took the name "Tony Martin." Tony Martin made his film debut as a singer in the film Foolish Hearts in 1935. In the Thirties he would go onto appear in such films as Follow the Fleet (1936), Back to Nature (1936), Pigskin Parade (1936), Sing and Be Happy (1937), Life Begins in College (1937), Ali Baba Goes to Town (1937), Up the River (1938), Winner Take All (1939), and Muisc in My Heart (1940). Tony Martin was also the featured vocalist on the legendary radio show The Burns and Allen Show from 1937 to 1938. A running joke was that Gracie Allen (she and George were still portrayed as single, even though they were already married in real life) carried a torch for the handsome Mr. Martin. It was also in the late Thirties that Tony Martin's recording career began. Signed to Decca Records, he had his first hit in 1938 with "The Moon Of Manakoora," which went to #15 on the Billboard singles chart. His second single, "I Hadn't Anyone Till You," was also released in 1938 and would prove to be one of his biggest hits, going to #4 on the Billboard singles chart. He would have a string of hit records in the late Thirties that included "You Couldn't Be Cuter," "South of the Border," "It's a Blue World," and "Fools Rush In." While he would only make a few films in the Forties, arguably Tony Martin's most memorable film appearance came about in that decade . It was in 1941 he played one of the male leads in Ziegfeld Girl and sang "You Stepped out of a Dream" and "Caribbean Love Song." In the Forties he went onto appear in such films as The Big Store (1941), Till the Clouds Roll By (1946), and Casbah (1948). He continued to have hit songs in the early part of the decade, including "Tonight We Love" and "To Each His Own." Mr. Martin's career would be interrupted by World War II. He served for a brief time in the United States Navy, but left after unfounded rumours persisted that he had tried to buy a commission. He then joined the United States Army where he served in the Air Corps. Sadly, the rumours persisted even after the war, so that even though he had served honourably in the Pacific Theatre, nearly every major label refused to sign him following the war. In the end he would sign with the then smaller label Mercury Records. Mr. Martin would have several hits, first with Mercury and then with RCA Victor, in the late Forties, including "It's Magic," If You Stub Your Toe On the Moon," "There's No Tomorrow," "I Said My Pajamas (and Put on My Pray'rs)," "La Vie en rose," and"A Penny a Kiss." The Fifties would see Tony Martin at the height of his success. From 1954 to 1956 he had his own television series, The Tony Martin Show. He also guest starred on The Jack Benny Programme, Shower of Stars, and The George Burns Show. His film career was also at its height, as he appeared in several films throughout the decade. Among them were Two Tickets to Broadway (1951), Here Come the Girls (1953), Easy to Love (1953), Deep in My Heart (1954), Hit the Deck (1955), and Let's Be Happy (1957). Mr. Martin also had several hit songs throughout the decade, including "I Get Ideas," "Vanity," "Domino." Kiss of Fire," "April In Portugal," Stranger In Paradise," "Here," and Walk Hand In Hand." By the Sixties the Hollywood musical was in decline and rock music came to dominate the music charts, so that Tony Martin's career went into decline. During the decade he made two guest appearances on television, on The Donna Reed Show and Death Valley Days. He continued to record, but he would have only one more hit. "Theme from the Sandpebbles (And We Were Lovers)" failed to make the Billboard Hot 100, but went to #22 on the Adult Contemporary chart in 1967. He would make one final appearance on film in a cameo in Dear Mr. Wonderful (1982). Mr. Martin would continue to make personal appearances for decades. He had married legendary dancer and actress Cyd Charisse in 1948 and the two would remain married until her death sixty years later. The two toured together for years with a cabaret act featuring each of them. 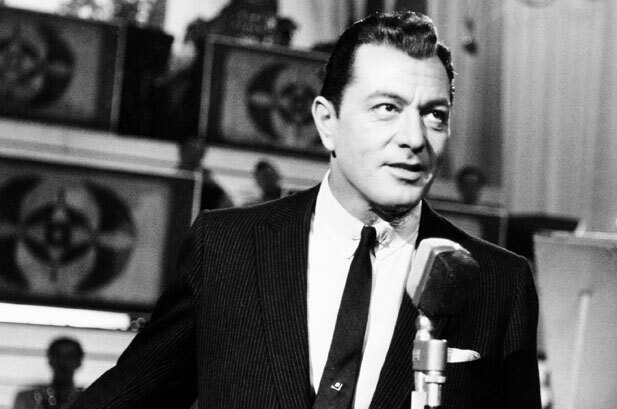 While Tony Martin may not be as famous as earlier crooner Bing Crosby or later crooner Frank Sinatra, he was as great a vocalist as either of them. He had a incredibly rich baritone capable of emotional subtleties of which many modern day performers are wholly incapable. One need only look at the "You Stepped Out of a Dream" sequence from Ziegfeld Girl. Even with such incredible beauties as Hedy Lamarr and Lana Turner on the screen, it is Tony Martin's voice that dominates the scene. While many others would record "To Each His Own," it is Tony Martin's version that is the quintessential one, largely because of his powerful voice. It was not simply Tony Martin's voice that set him apart from many singers. While many crooners, particularly Bing Crosby and Frank Sinatra, developed a more casual style, Tony Martin was the epitome of fashion. It was rare indeed that he did not appear in black tie. In fact, he had such a sense of style that in the early Fifties a tuxedo was even named for him. While his fashion sense was definitely formal, his style in live performances was not. Tony Martin was known not only for singing in his personal appearances, but for his stories and remembrances of those who wrote the songs he performed, fellow performers, and so on. As a performer on stage he was very personable. Indeed, as great as Tony Martin's voice was and as chic as his sense of style was, it was perhaps his sincerity that made him a success. He could take any song and sing it as if he meant it. Few could match Mr. Martin for the emotion he put into his singing. While others had recorded Cole Porter's "Begin the Beguine" before him and others would do so after him, it is arguably his version that stands out the most. The simple fact was that Tony Martin could take any song and make it entirely his own, singing it as if it was the story of his life. Few singers, even ones with voices as great as that of Tony Martin, possessed that gift. That Tony Martin did makes it a certainty that people will be listening to his songs for decades to come. Geoffrey Hughes, who played Onslow on Keeping Up Appearances and provided the voice of Paul McCartney in the animated classic Yellow Submarine died on 27 July 2012 at the age of 68. The cause was prostate cancer. Geoffrey Hughes was born on 2 February 1944 in Wallasey, Cheshire, England. He attended Abbotsford Secondary Modern School, Norris Green, Liverpool. After he finished school Mr. Hughes worked as a salesman in a department store and in his spare time acted with the Merseyside Unity Theatre, an amateur acting troupe. He received his break when playwright Alan Owun and actor Tom Bell watched Mr. Hughes perform in one of Mr. Owun's plays. Mr. Bell made him an offer to go with him to London where he would get him an agent. Mr. Hughes was ambivalent about the offer, and took a position with the repertory at the Victoria Theatre in Stoke-on-Trent instead. It was six months before he took up Tom Bell's offer. Less than a year later he made his debut on the West End in Lionel Bart and Alun Owen's musical Maggie May. He would return to the West End several times, including Run for Your Wife, The Secret Life of Cartoons, The Wonderful Wizard of Oz, and several other productions. It was in 1966 that Geoffrey Hughes made his television debut in two episodes of The Likey Lads. In the late Sixties he would also appear in the TV programmes, ITV Play of the Week, Sorry I'm Single, City '68, Randall & Hopkirk (Deceased), The Wednesday Play, Wicked Women, and Up Pompeii. He was a regular on Currry & Chips. He made his debut in Smashing Time in 1967 and provided the voice of Paul McCartney in Yellow Submarine (1968). In the late Sixties he also appeared in the films The Bofors Gun (1968), Till Death Do Us Part (1969), The Virgin Soldiers (1969), and The Man Who Had Power Over Women (1970). It was in 1974 that Geoffrey Hughes first appeared as Eddie Yeats on Coronation Street. He would play the role until 1983. In the Seventies he also appeared on the shows Shadows of Fear, The Mind of J. G. Reeder, Play for Today, Thirty-Minute Theatre, Dad's Army, Z Cars, Crown Court, Don't Drink the Water, and Mr. Big. He also appeared in the films The Blood on Satan's Claw (1971), Revenge (1971), Carry on at Your Convenience (1971), Tiffany Jones (1973), Adolf Hitler: My Part in His Downfall (1974), Confessions of a Driving Instructor (1976), and Nijinsky (1980). In the Eighties Geoffrey Hughes continued to appear as Eddie on Coronation Street and also appeared in the shows The Bright Side, Doctor Who, Flying Lady, Screen Two, Coasting, and You Rang, M'Lord. It was in 1990 that Geoffrey Hughes first appeared as Onslow, the work shy and bone lazy brother in law of would be social climber Hyacinth Bucket (played by Patricia Routledge). He remained with the show until 1995, the entirety of its run. He also appeared in the shows Spender, Making Out, Boon, I. Lovett, The Upper Hand, and Polterguests. In the Naughts he played Vernon Scripps on the show Heartbeat from 2001 to 2007 and Twiggy on The Royle Family from 1998 to 2008. He also appeared in the shows Casualty and Skins. He appeared in the films Expresso (2007) and Flick (2008). In 2009 Geoffrey Hughes was appointed Deputy Lord Lieutenant for the Isle of Wight. Geoffrey Hughes was one of the great comic actors of British television. His two best known roles, that of Eddie on Coronation Street and Onslow on Keeping Up Appearances, could best be described as lovable oafs. And while Mr. Hughes had a flair for playing such roles, his talent went well beyond such parts. It was early in his career that he provided the voice of Paul McCartney, doing so well that many thought that it was the genuine Beatle who had provided his own voice. He also played Pistol in a stage production of Shakespeare's Henry V, the Cowardly Lion in a stage production of The Wonderful Wizard of Oz, and Trinculo in a BBC film version of Shakespeare's The Tempest. While he had a flair for playing affable rouges, his talent went much further. 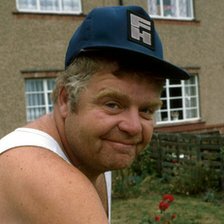 Indeed, I must say that Onslow was my favourite character on Keeping Up Appearances largely because Geoffrey Hughes played him so well. Indeed, it is hard to picture any other actor in the role. I must admit I was somewhat surprised when I learned the actor who played Onslow was also the voice of Paul in Yellow Submarine! Geoffrey Hughes was a very funny man and a man of considerable talent. It is so sad to know he is gone.